It’s not as complicated as you may think. I’m not trying to be like a Sphinx giving you an almost unsolvable riddle to pass. If you are in the business of setting appointments to make sales for your company to achieve revenue, the answer should be easy enough. That’s right –higher appointment conversion rate at your business. Now, it is lofty to dream of achieving a conversion rate of 100% (but I won’t stop you from trying). Even if you are killin’ it in your industry with a higher-than-average conversion rate, you should never be satisfied with where you are. Just as in life, with a bit more effort, you can always improve. How is it that you can increase your conversion rate in one straightforward way? You need to decrease your lost appointment opportunities. Less missed opportunities = More appointments made. Now the question that may remain is: How do I decrease my missed opportunities? How can you increase your conversion rate without first knowing what it is? Use call tracking data to see where you currently stand, and even look at past historical and trending data to see if any recent changes you may have implemented or seasonality have made a difference on your conversion rate, either positively or negatively. You can also use call tracking data to see how many appointments you don’t set. Set up missed opportunity alerts with your call tracking provider to be in the know shortly after a missed opportunity occurs so that you can rectify the situation. Once you know you have missed out on an appointment opportunity, dedicate an employee to be responsible for making outbound calls to make a second attempt to recover that lost lead! Want to track how successful your outbound recapture attempts are? Download our free Appointment Follow-Up Worksheet. Before that caller moves on to call your competition, try to win back their business with a helpful and pointed call back to address the issues or problems they may have had that deterred them from booking an appointment with your business in the first place. One of the easiest ways to achieve less missed opportunities is to improve call handlers’ phone handling skills. When employees perform better on calls, they are more likely to set the appointment with a caller. Poor performance will lead to more missed appointments –make sure that your call handlers have the training and skills that they need to book more calls. Going hand in hand with better call handler phone skills is ASKING callers to book an appointment with your company. Sure, call handlers can still have a “good” call but is it successful unless the outcome of that call results in an appointment to lead to a sale? Keep track of how many more appointments you can book by merely requesting when you may not have asked before – and asking at least two times (without being overly pushy). 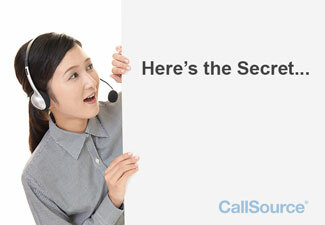 So there you have it: the secret to improving your appointment conversion rate. Of course, this is a basic overview, and CallSource advisors can work with your team for a more individualized approach based on your business’ specific problems to help you better your ROI and appointment rate. Want to learn more? Talk to a CallSource representative now, and don’t forget to track your recapture attempts with our free tracker sheet.